Artist and conservationist Karen Laurence-Rowe was born in Uganda, and was the daughter of a civil engineer. As a family they lived a nomadic existence moving around East Africa to wherever a road or a bridge was needed. Home, in those early years was often a prefab wooden site house with lions and hyenas breaking the sounds of the night and constant attacks on the chicken house by various beasts! With no towns or cities around for hundreds of miles, Karen and her siblings would draw to entertain themselves. These memories of Africa’s virtually unspoiled landscapes, teeming with game and magnificent views, were to influence her subject matter as an artist in later years. Karen now resides in Kenya and is the founder of Artists Against Extinction, winner of the 2012 David Shepherd Wildlife Artist of the Year Award, Artists for Conservation’s Simon Combes Conservation Artist Award in 2015 and David Shepherd Personal Choice Award 2017. 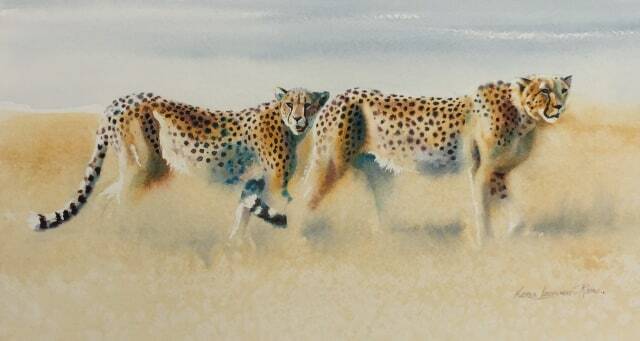 Although Karen is most well known for painting African Wildlife she is just as interested in capturing the landscapes, seascapes and the people of the country she is in. She is extremely versatile in medium and style and can switch easily from oils into watercolours or charcoal. Karen’s paintings grace the walls of many an art lover both in Kenya , where she lives, and in homes all over the world. She paints from her Studio in Nairobi which enables her to get into the field regularly to sketch and photograph the wildernesses that she so loves. Karen's concern for what it happening to the wildlife and the wildscapes around her is reflected deeply in her work. She regularly donates to conservation.